I was honored to be able to write for art, ltd. magazine about this epic exhibition at the Nevada Museum of Art, “Tahoe: A Visual History.” This is a history-making show. 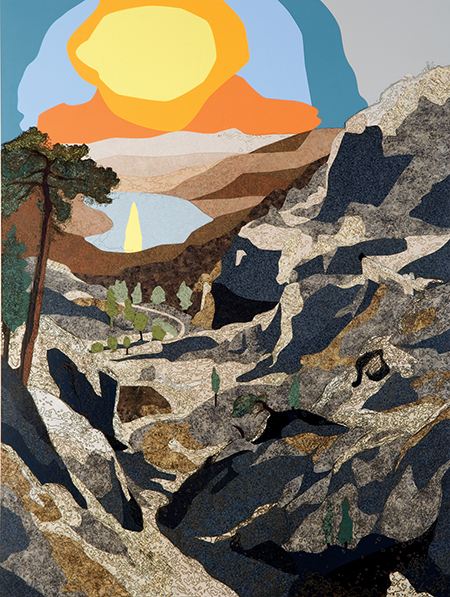 “‘Tahoe: A Visual History,’ on view at the Nevada Museum of Art in Reno until January 10, 2016, is a seminal exhibition: the first to document the art history of Lake Tahoe and the surrounding area, including the much storied Donner Pass. The exhibition follows in the spirit of documenting the art of other natural, national treasures such as Yosemite, Niagara Falls, and Yellowstone. Curator Ann M. Wolfe, who spent the last five years planning the show, says that she aimed to make it a comprehensive and straightforward survey. 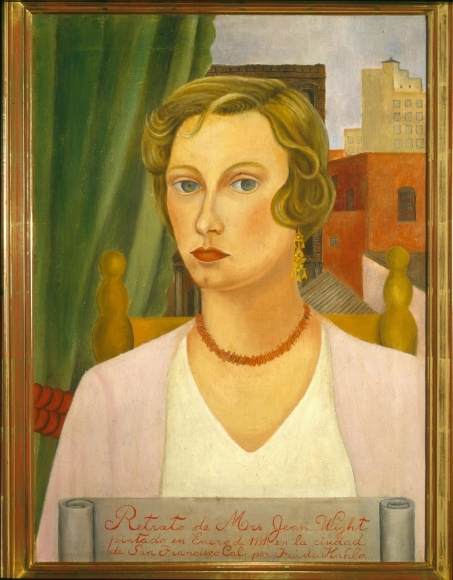 “We recognized that this show should lay a foundation that future curators and scholars can work from, to create more thematic exhibitions on the subject,” she notes. “For that reason, it’s primarily laid out chronologically with just a few thematic elements.” Among the contemporary works on display are numerous pieces that were commissioned by the museum specifically for the exhibition. Thus, the show is not just an in-depth look at the art of the area, it enriches this ever-evolving dialogue as well. Read more . . .
“The title of Julio César Morales’ exhibition of new works at Gallery Wendi Norris notifies the viewer that this work will not be light or, at its essence, easy—and this is the case, though Morales’ difficult subjects are deftly handled, able to be contemplated and digested in all their anguish. “The work in Emotional Violence continues Morales’ ongoing conceptual exploration of such weighty and all-too-current topics as illegal border crossing, drug smuggling, human trafficking, displaced peoples, and informal economies. As has long been his practice, Morales looks to the media and documentary photography for source material to inspire the ceramic, video, and flat works included in the exhibition.” Read more . . .
Having taken a week off for the holiday, Art Beat Bay Area returns with this weeks picks of some of the Bay Area’s amazing art offerings, as well as a look at what’s to come. Marcel Dzama at Crown Point Press, San Francisco (through Jan. 2): In his signature darkly humorous and playful style, Dzama explores fairy tales, ballet, and terrorism, among other topics, in this show featuring three new prints, a series of twelve etchings collectively titled “The Fallen Fables,” a selection of black-and-white collages, and three films. There is also a short video documenting Dzama’s time at Crown Point Press that gives insight into the work and the artist’s process. 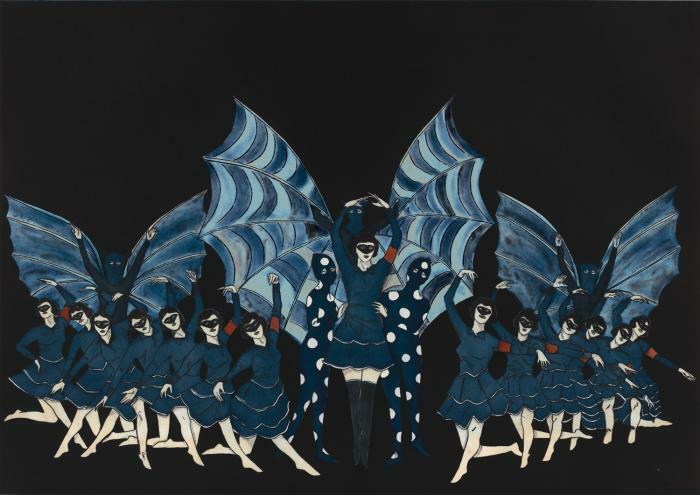 Dzama continues to work in his highly recognizable and much beloved aesthetic (one writer referred to his popularity as “Dzama-mania”), and the work features characters viewers have become familiar with from past pieces; his art readily invokes thoughts of that by Henry Darger. When stopping in to view the work, be sure to pick up the Crown Point Press newsletter, Overview, which features an informative essay about the work written by Kathan Brown. “The Mapmaker’s Dream” at Haines Gallery, San Francisco (through Dec. 23): This excellent group show features work by Maurizio Anzeri, Marius Bercea, Linda Conner, Chris McCaw, and Pae White. The works all address, as the show title directly states, ideas around mapping. By example, Anzeri sews geometric shapes onto vintage landscape photographs, invoking ideas of very simple architectural plans, what future structures over that space might look like. White’s video Dying Oak/Elephant is features digital animation created from the scanning of an 800-year old Oak tree, which resides on the For-Site property in Grass Valley; the artist created the video during her residency there. The resulting piece is mesmerizing and fluid; it has the appearance of traveling through the human circulatory system, flowing through a network of interconnected vein-like structures that ebb and flow in their density, sometimes breaking apart into a collection of dots. Throughout, this well-curated show is a thoughtful, engaging, and thoroughly enjoyable. “Looking Back: 45 Years” at John Berggruen, San Francisco (through Dec. 19): This show firmly establishes why the John Berggruen Gallery has been considered one of the finest modern masters galleries around, especially when it comes to the work of Northern California artists, and more specifically, those from the Bay Area Figurative movement including Richard Diebenkorn, David Park, and Nathan Oliveira. Works by these artists as well as that by such well-known names as Frieda Kahlo, Georgia O’Keeffe, Clyfford Still, Wayne Thiebaud, and Ed Ruscha, among others, cover the two floors that comprise the gallery. It is an exceptional, not to miss show. The timing of a gallery retrospective is fitting as this is the gallery’s second-to-last show in its downtown location; an announcement of where the gallery is moving to will be made in the coming weeks. Guy Diehl , “A Dialogue with Tradition II,” at Dolby Chadwick Gallery, San Francisco (through Dec. 5): Guy Diehl continues his decades-long career of exploring the traditional genre of still life. Once again, he delivers a show of exquisitely painted, moody and graceful works variously featuring books, bottles, and fruit, among other objects. References to art history, both direct and indirect, abound. This is a excellent opportunity to view exceptionally well painted and beautiful pieces. Thursday, December 3 is First Thursdays in San Francisco. Opening December 4, Oakland: Erik Parra, “each devil his own,” at Transmission Gallery. An opening reception will take place Thursday, December 4, 6 to 9 p.m.
December 12, 5 to 7 p.m., Oakland: Open Studios and Group Show, “Something for Everyone,” at Lost & Foundry Studios, 305 Center Street, Oakland. Featured artists include Alexis Arnold, Jeff Hantman, Bridget May, Chris McNally, Kim Miskowicz, Mansur Nurullah, Pamela Palma, Steve Smith, Chris Wells, and Erik Zo.